Veteran handicapper Tom Amello understands that it’s easier to attract people to the racetrack by promising them fun than by requiring them to attend some sort of handicapping school in order to feel like they belong. He’s devised a clever simplistic betting system that enables newcomers to make smart selections by reading the odds board. In other words, he believes there’s no greater wisdom than that shown by the public. 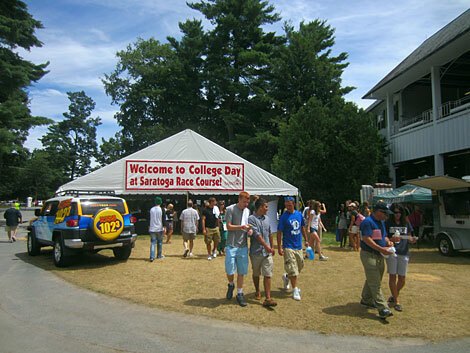 There were a lot of smart people whose last thoughts were on attending classes at Saratoga on Thursday, as the track celebrated its fifth annual College Day. The students could have easily picked Amello’s method up in the snap of a finger. Why anyone can. But they seemed more intent on winning one of ten $1000 scholarships being offered and having fun in their school gear, getting a free tee-shirt, posing in a photo booth with friends and eating junk food. Track lures college students in with free admission and chance to win scholarships. Emily Roden of Watervliet, NY and Kassaundra Guilbeau of Latham, NY hand out free tee-shirts to college students. Old college grads will recall when there was a steeplechase daily – the third race of the day squeezed in between the daily double and the four other races on the card. Now the jumpers have been cut back to the first race on Thursdays. NYRA handles more on a five-furlong sprint for maiden NY-Bred claimers than a race in which form is a mystery and competitors can fall and never finish. The “up and overs” are a joy to watch. Should money drive everything? 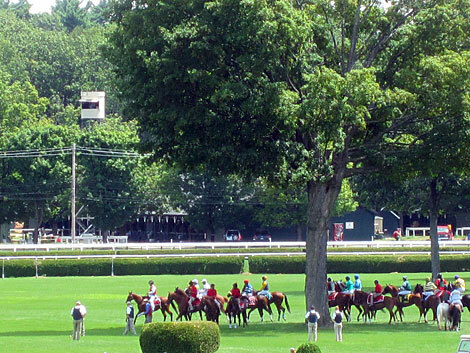 Steeplechase horses partake in Saratoga ritual of circling infield tree before going to the post. Jonathan Sheppard saddled Martini Brother to win the $75,000 Jonathan Kiser Novice Stakes. His training victory kept an enormous streak alive. The Hall of Fame trainer has won a race at Saratoga in each year since 1969. It was a big day for another Hall of Famer, jockey John Velazquez. Johnny V tied Jerry Bailey at 693 for the most career victories at Saratoga. He may set a record that nobody will ever catch, unless, of course, they stretch the season longer. Velazquez won with the 1-2 first-timer Corfu in the second race, even though it appeared Crescent, a More Than Ready colt trained by Bill Mott is a horse to consider in the future. He piloted the 3-5 filly Our Amazing Rose to an even easier, and more impressive, maiden special weights score in the fifth. His record-tying ride came in the sixth aboard White Rose, a Tapit filly that cut through the field in the last 1/8 mile like a hot knife through fudge. For those in need of a classroom, Michael Ondaatje, author of The English Patient and, more recently, The Cat’s Table, read from a new work at Skidmore College’s NYS Writer’s Institute in the evening. 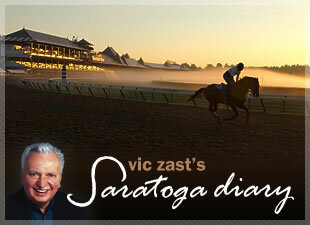 Vic Zast has attended the races at Saratoga for 49 straight summers. Zast was a college student when he began coming to the Spa and he never went to a class to learn how to be a horseplayer.